My grandma Georgette is Belgian. When my brother and I were growing up, our family celebrated St. Nicholas Day, on the eve of the 5th/6th of December, in an adapted Belgian tradition. We'd leave out our wooden shoes overnight, and in the morning they were filled with little treats, "shoe stuffers" and a new ornament for our miniature trees. In the evening our grandma would come over and we'd eat Belgian chocolates, and speculoos (windmill cookies) & pizelles she had made. Now my brother and I don't live close enough for "St. Nicholas" to put gifts in our shoes, but my grandma and mom still carry on the tradition. This year my grandma made a beautiful apple pie for my mom to take home and share with my dad. 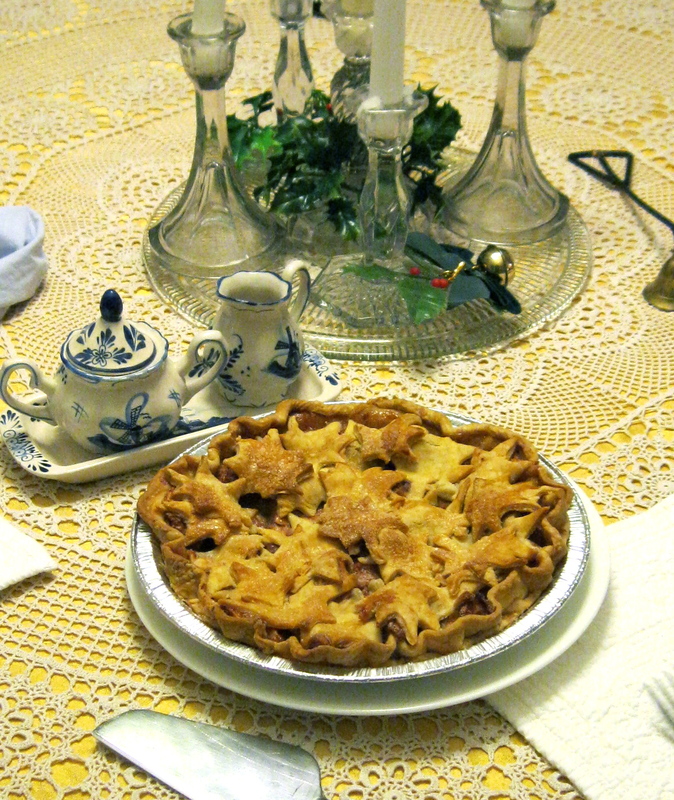 My grandma's beauteous apple pie, which she put in a trompe l'oeil pie tin for transport. She is cute like this. I'm excited to go home and visit with her over Christmas. This year I plan to make some audio recordings of us in the kitchen together, with her talking through some of my favorite recipes of hers, including her chicken soup, sugar cookies, speculoos, and apple pie. I'll be sure to include it here. The table cloth is from Belgium, too. Her mother, Alphonsine, was half French.